The resources on this page are for use by AGF Ambassadors. Please contact your AGF Manager with questions about the information provided here. As a reminder, event reports are to be submitted after each event hosted. For ideas and inspiration, visit the sample materials page, where you can find items created by fellow Ambassadors. 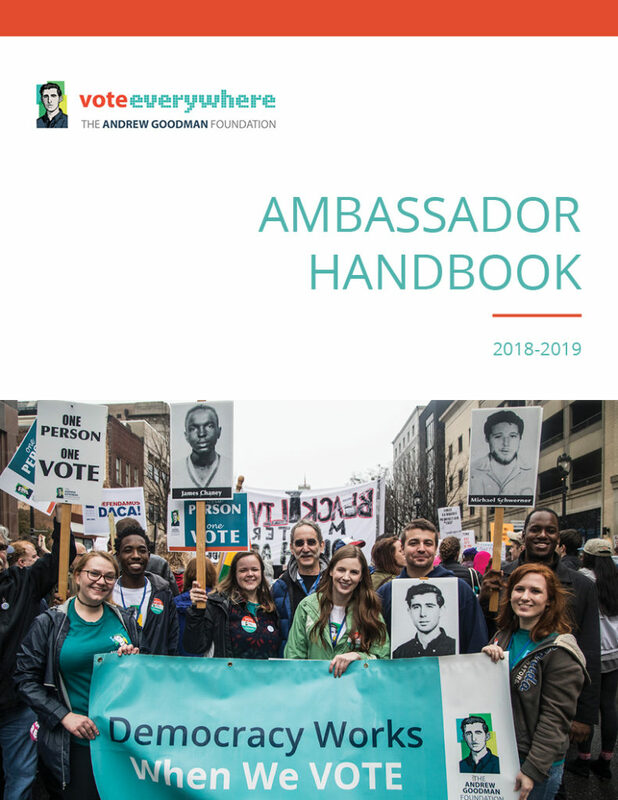 The Ambassador Handbook is the go-to guide for voter engagement on your campus. Before hosting any voter registration drives or other events, it is crucial that you become familiar with the contents of this manual. Ambassadors receive a printed copy of the Handbook annually, along with other supplies. The Campus Voter Information Portal (CVIP) is a one-stop-shop where students can find relevant election information. They can register to vote, check their voter registration status, learn about the candidates, find their polling site, learn about voter ID and other requirements, and sign up to receive text message reminders, with information tailored to their campus. To combat low voter turnout, especially among traditionally marginalized populations, Vote Everywhere Ambassadors at Bard College created a voting guide for the tri-state area that details the voter registration process and explains voting issues specific to survivors of domestic violence. Click here to access the guide. 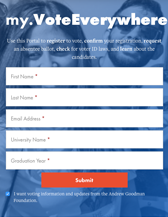 Learn more about The Andrew Goodman Foundation’s newest digital resources to increase youth civic engagement: the Campus Voter Information Portal. 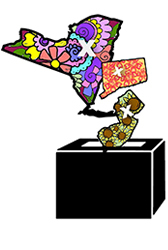 What should you keep in mind when registering voters at residential colleges? Learn about voter registration on college campuses. Change is the product of action. How will you impact your community this semester? Learn about the importance of building partnerships and coalitions on campus to support and maximize the impact of your voting and social justice activism efforts. Your college or university received a copy of its NSLVE report, now what? Learn how put your report to good use.